Fifty people including citizens, representatives from Community Based Organizations (CBOs), NGOs, INGOs, government, and traditional authorities turned up at the Rumphi Malin Lodge to reflect on their recent efforts to innovate together and address emerging issues of trust and power within their group. They came by bicycle, mini bus, car, motor bike and on foot from almost every corner of Rumphi, a rural district in the Northern Region of Malawi covering almost 5000 km with a population of about 128,000. In 2018, all had participated in the launch of the Rumphi Social Lab. Now, the second major event of the Rhumpi Social Lab – the Reflection Workshop – was about to begin. We recently introduced our work with the USAID funded Local Works program to test alternatives to the traditional development assistant model. 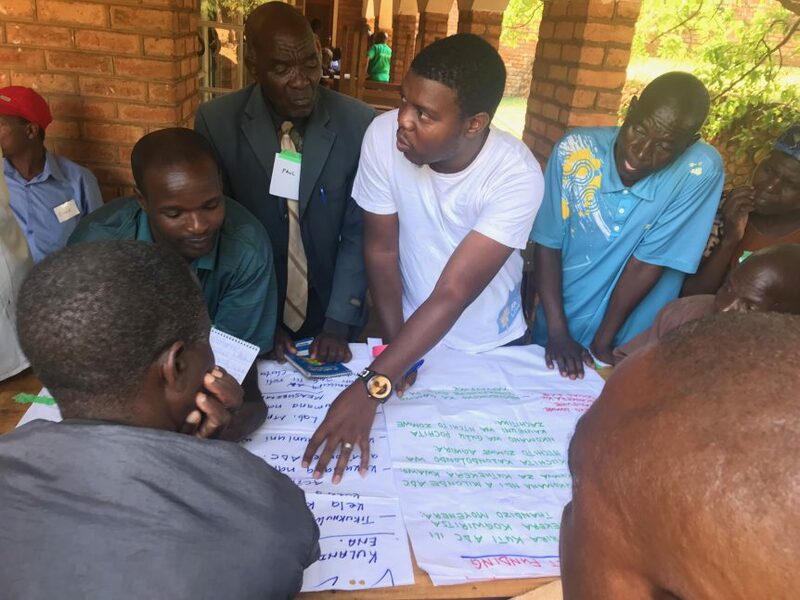 As part of this work, Root Change, along with our partners Keystone Accountability and Youth and Society, is piloting two district level social labs in the north and south of Malawi. The Rumphi Social Lab brings together a diverse set of Malawian change makers who live and work in the district and supports them in identifying new ways of working that puts ownership of development squarely in local hands. The social lab makes no grants, gives no stipends and offers no training but rather provides modest resources for learning through “lean experiments” and relies on the energy and commitment of participants who want to see development done differently. For perhaps the first time ever, chiefs/traditional authorities, District Council members, village development and area development committees, citizens, CBOs, NGOs, and international NGOs were participating together at the same event and attempting to level the playing field so there could be equal participation by all. Participants were treating this new venture called a social lab as their own unique space for collaborative learning and innovation. As part of the reflection, the social lab participants created their own vocabulary to describe their unique role within the lab: duty bearers and rights holders. Everyone is a “duty bearer” accountable to his or her team and each team has a responsibility to every other team to uphold the social lab’s informal code of conduct. Teams are given a small amount of resources ($500) to enable them to meet together and with stakeholders. It was agreed that this money does not belong to the individual teams or, for that matter, to Root Change, Keystone, or YAS. The money belongs to the Rumphi Social Lab itself. In this sense, every individual and team is also a “rights holder” and has the right to question another team about how its money was spent, the right to align the direction of the social lab with the interests of participants, and the right to have his or her voice heard. 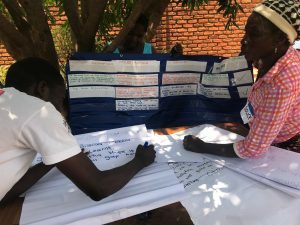 These practices are particularly meaningful given the diversity of roles and the Rumphi participants represent and the power dynamics present within the development system. We are learning that this process of reflection is critical for wrestling with, addressing, and in some cases, overcoming existing power dynamics within the group. Over two days, the five social lab teams shared the progress that had been made on the experiments that they had designed and initiated as part of the social lab launch event a few months earlier. During presentations, lab participants acted as “critical friends” by providing feedback on the experiments to help groups remain focused on the goal of supporting local ownership and accountability within aid and civic spaces. For example, one group is working to investigate how the local government’s financial resources are allocated “in the name” of community members. To do this, the group worked to obtain information from the District Council on public projects funded under District Development Fund (DDF) and the Constituent Development Fund (CDF). They successfully accessed this information and have been working to investigate projects in relevant communities and hold the District Council accountable. Lab participants challenged this group and pointed out that they run the risk of working in isolation, rather than empowering the community and citizens to monitor projects and demand accountability from the District Council themselves. The group was reminded that their role should be to improve the relationships and roles of actors in the system and not to replace them by acting on behalf of the community. As a result of this feedback, the group iterated on their experiment design and planned to focus on sensitizing citizens of four communities on DDF and CDF guidelines. 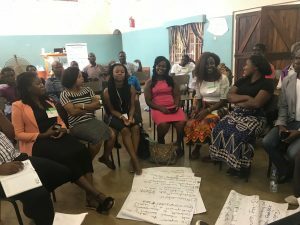 This example demonstrates the trust that has been built within the social lab, making critical feedback possible, and the collaborative learning that is taking place as citizens, NGOs, and government actors reflect on their role in civic spaces in Malawi.